Info: So little time...so many people to appreciate. Not to worry. 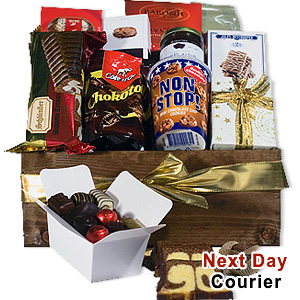 You can now surprise and delight the entire office or the whole family with this wonderful collection of gourmet goodies. This gift basket contains handmade Belgian chocolates, Duc D'O Belgian flaked truffles, Côte d'Or assorted bouchées 8 pcs, marble cake, Baronie cherry chocolates with liqueur, New Tree  Pur Plaisir chocolate spread, chocolate coated nut and fruit mix, chocolate mini cookies, Côte D'Or Chokotoff candy 8 pcs and Destrooper Virtuoso.